“So many people are gathered at a site that is not traditionally a city. What do you do with a population such as this? Where will this waste go?” says Awadhendra Sharan, professor at the Center for the Study of Developing Societies in Delhi, India, and an authority on river pollution, who was not involved in the study. The Kumbh Mela or “pitcher festival” is based on a Hindu myth in which five deities brawled over a pitcher of a sacred elixir, accidentally spilling it over four different sites. Today, the festival rotates between these sites, with an event occurring roughly every three years. This is not the first time the festival spurs health concerns. Experts have long recognized it as a major cause of cholera epidemics during the 18th and 19th centuries. However, the study is the first to document the direct effects of pilgrimage on a river’s microbial community. The researchers saw a 130-fold increase in the total number of bacteria following the festival. They also discovered that most of the naturally occurring bacteria in the river were replaced by microbes usually found in human skin and feces. There were also elevated levels of pathogens that cause salmonella, whooping cough, staph infections and tuberculosis. The presence of drug-resistant microbes is particularly concerning, according to Avinash Sharma, one of the study’s co-authors and a microbiologist who works at India’s National Centre for Cell Science in Pune. “Water is an open system,” Sharma says. “If the water is not treated, it goes to different areas,” which may lead to bacteria swapping genetic material with one another without reproducing — that process is known to speed the proliferation of drug-resistant strains of bacteria. This could lead to antibiotic resistance spreading downstream through the river, Sharma says. It’s hard to say whether the increase in disease pathogens leads to an actual increase in human infection. Many cholera outbreaks have been traced back to the Kumbh Mela, but there has been little research on the festival’s direct impact on the spread of illnesses. The research could provide valuable information for epidemiologists tracing disease outbreaks in the future, according to Sharma, who plans to replicate his study at future festivals including the Kumbh Mela in 2019. Sharma’s results are important but not surprising, according to microbial ecologist Edward Crane from the National Science Foundation, who was not involved in the study. When you disturb a natural system that much, he says, “it’s not unusual to see the [bacterial] community shift.” Still, it’s important to document how the river changes in order to prepare effective strategies to quash outbreaks, he adds. 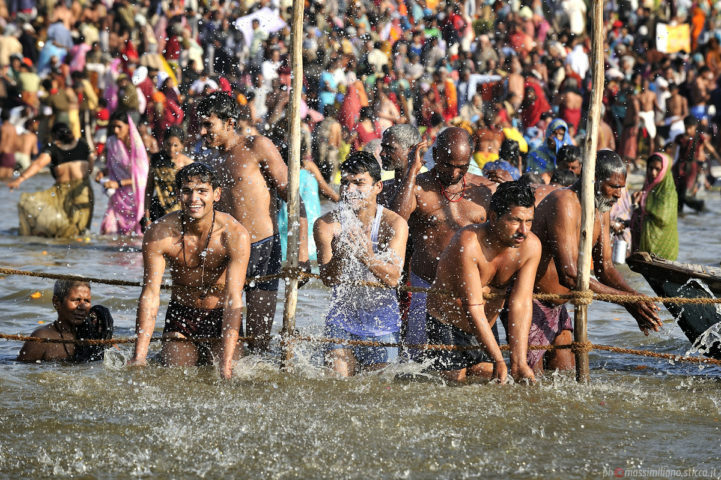 Managers of the Kumbh Mela have already taken steps to try to reduce the risk, says Sharan from the Center for the Study of Developing Societies. At the 2013 Allahabad event, 45 percent of the festival’s budget was devoted to installing dozens of chlorination tanks, thousands of toilets and 14 tent hospitals, where visitors suspected of infection were screened for cholera and other diseases before bathing, according to a review of the event published in the International Journal of Infectious Disease. It’s at least an improvement on the 20 percent organizers spent on health in 1966. The organizers could consider also enforcing strict rules that would require bathers to shower before going into the river, Sharma says. But it’s not just bathing that can spread disease. It’s tricky to construct a pop-up city that can accommodate tens of millions of people. Inadequate infrastructure – like plumbing and waste disposal – can lead to unsanitary conditions. While organizers have made strides in this area, there’s still room for improvement. Even more challenges arise when scientific research seems to fly in the face of religious beliefs: Why should people care about pollution when the river is holy and clean in their eyes no matter what? This interplay will continue at the next Kumbh Mela, where Sharma will continue the research. He’ll be there, among the bathers. But instead of swimming he’ll be collecting microbe samples—before the crowds arrive, and in their wake. The original version of this article stated that Sharan was the first to document the direct effects of pilgrimage on the river’s microbial community. The study was actually authored by Avinash Sharma. What an interesting article and great writing…the cultural and religious dynamics between the scientific and the sacred. Hasn’t this been a challenge for as many years as we’ve consider science? I Know this author and want to follow her work.